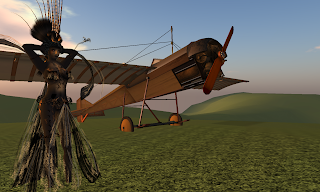 A couple days ago, I read an entry on Momos Blog (a great blog authored by Miefmupfel Willis) showing a very cool avatar design. I'm always a sucker for unusual stuff like this, and the design looked striking, so I headed over to the store, alpha.tribe, and it was all I could do not to purchase everything in the shop! These avatars are gorgeous works of art, wrought with beauty and style. Each is a complete outfit, with skin, clothes and attachments, and many include both female and male versions. The one above (photo taken at AM Radio's Superdyne area at IDIA) is called La Belle Epoque.